China's main TV station has stopped broadcasting matches from the country's top football league, accusing players of lacking "professional ethics". China Central TV (CCTV) has temporarily pulled the plug on a league that seems constantly beset with problems. A scuffle broke out between players of two top teams last week, while another team has been ejected from the league. In an interview with Titan Sports, China's top sports newspaper, Jiang Heping, head of the CCTV sports channel, pointed the finger at the players. He told the newspaper that every week brought fresh bad news about players, who he said were letting down their fans. "Some lack even the minimum professional ethics," Mr Jiang said. "The state of Chinese football at the moment makes everyone feel bitter. If it goes on like this, it's in danger of being thoroughly destroyed," he added. Mr Jiang said the ban was only a temporary measure and did not mean CCTV would completely abandon the Chinese Super League. But he said things needed to change for the better. However, that looks a long way off, with the bad behaviour of footballers dominating the headlines again last week following a match between teams from Beijing and Tianjin. A scuffle broke out that eventually involved team coaches. Reports said that after the game angry Beijing fans laid siege to the Tianjin team bus. A team from Wuhan was also recently thrown out of the league after refusing to play matches in protest at a ban given to one of their players. 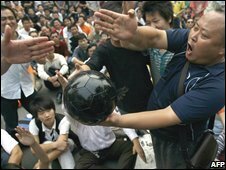 Football is popular in China, but the domestic game has long been in the doldrums. There have been problems finding sponsors for a competition which attracts angry crowds, and has problems with match fixing and bribery. The national team has done little better. China qualified for the 2002 World Cup Finals in Japan and South Korea, but results since then have been poor. The team currently languishes at 98th in the FIFA world rankings.